Buckfire & Buckfire, P.C. 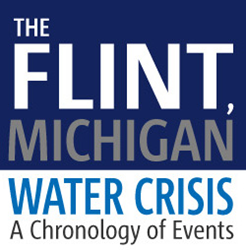 creates The Flint Water Crisis Timeline Infographic to display the sentinel events in chronological order that led to this major public health crisis. A great resource for teachers and students. Buckfire & Buckfire, P.C., a Michigan personal injury law firm, has published the Flint Water Crisis Timeline Infographic. The crisis has garnered international attention and has been widely covered in both the media and recent presidential debates. The timeline shows the handling of this situation by the state and local government and how it escalated to congressional hearings. The infographic details exactly how and when this crisis began, as well as the key events leading up to Governor Snyder’s testimony before a Congressional Sub-Committee on March 17, 2016. It also demonstrates the hardships and health consequences residents of Flint have endured as a result of ingesting contaminated water. With the increased number of reported cases of lead poisoning and Legionnaire’s’ Disease since the change in the Flint water supply, there is no end in sight to this environmental health crisis. The effects of the water crisis will be felt on this community and its residents for decades to come. Lawrence J. Buckfire is regarded as the top child lead poisoning lawyer in Michigan. He has represented hundreds of lead poisoned children in civil lawsuits throughout Michigan and Ohio since 1997. “I created this infographic so that the public could better understand how this crisis began and the events that have occurred since this public health catastrophe was uncovered," said Mr. Buckfire. The timeline will be updated as the saga continues for many years in the future. Buckfire & Buckfire, P.C. is a six attorney law firm in Southfield, Michigan. We encourage you to share this infographic with friends, family, colleagues, and students. Additionally, this infographic may be shared and embedded on websites, blogs, social media and other internet resources. Feel free to print and distribute the infographic to students and colleagues.